In a medium sized pot combine the water and butter together and bring to a boil. Once boiling add the flour and salt to the water mixture and turn the heat down to medium. Mix continuously for 1 minute with a wooden spoon, this will cook the flour. Let choux dough sit for a few minutes to cool. Using a stand mixer, hand mixer or a spoon, gradually add the eggs one at a time, beating the whole time. Line two cookie sheets with parchment. Using a pastry bag fitted with a number 10 tip, make a quarter sized ball shape out of the choux dough. If you do not have a pastry bag, use a teaspoon to drop balls of dough onto the pan. Bake for approximately 15 minutes until the puff is golden brown and feels very light when picked up. Let cool completely before filling. Using a fork, mash the raspberries in a small bowl and set aside. Combine the whipped cream, vanilla, lemon zest and sugar. Whip in a stand mixer or with a hand blender until peaks form. Fold in the macerated raspberries gently by hand. Make the glaze by combining the icing sugar and water. Add a small amount of food colouring (I use Wilton) and mix to combine the colour. 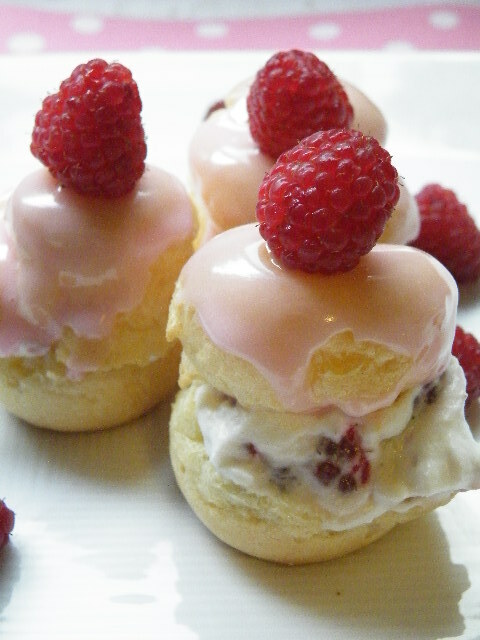 Dip the tops of the puffs in the glaze, top with a raspberry and let dry. Store in the fridge until you're ready to serve.